Bees pollinate important food crops, and honeybees provide people with honey. Wasps, although we usually think only about their stings, are also beneficial. They kill large numbers of plant-feeding insects and nuisance flies and feed them to their young.2,4 In addition, both bees and wasps have important ecological functions. Because of bees' and wasps' many benefits, entomologists, like those at Washington State University,2 advise leaving them alone "unless their stings present a hazard. "2 It's sound advice! If bees or wasps are disturbing your picnics, or if a nest is too close to your home, there are a couple of things to remember. While they may appear threatening, many bees and wasps are not aggressive and will only sting when handled or stepped on. Most are beneficial to the environment and your garden. If you'd like to do something other than reach for a spray can of poison to deal with stinging bees and wasps, you'll first need to correctly identify the insect and determine whether it's a threat. Each species has different behavior, and successful nonchemical management techniques are tailored to the particular species. If you decide that the bees or wasps need to be removed, be careful! These pests sting and can be dangerous if you are allergic to their venom. Read the Yellowjacket page or the Yellowjackets factsheet for more information and tips for trapping and removal. Control: Baldfaced hornets' nests are located above ground and can sometimes be removed without professional help.5 Hanging nests can be removed by placing a garbage bag over a wire hoop made from a clothes hanger. Hit the nest with a gloved hand, knock it into the garbage bag, and close the bag quickly. Then place the bag in the freezer to kill the hornets.5 Large nests may need to be removed professionally. Most of the hornets will die as they are sucked up the vacuum hose.5 After you turn the machine off, cover or stop up the end of the hose and leave the vacuum cleaner alone until all the insects have stopped buzzing. To make sure they're dead you can then put the bag in the freezer. Control: Paper wasps can be left alone in many cases. Around doors and other busy areas, it's easiest to remove nests early in the season as the queen is starting to build her nest.9 The nest can be knocked down or hosed down. When nests are still small, they can also be vacuumed off at night when the queen and workers are home. Use a long extension wand on a shop vac that has few inchess of water plus a little dish detergent. Exercise caution when dealing with European paper wasps. 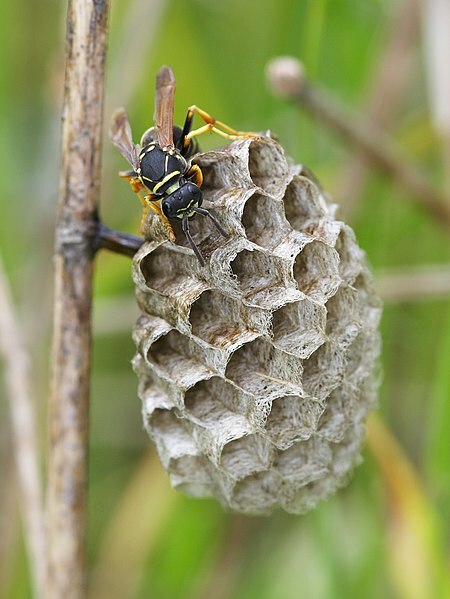 Control: Oregon bee removal specialist Tom Howell recommends leaving mud dauber nests alone because they are extremely docile, and there is only one per nest. He knows of only two people who have ever been stung by a mud dauber. "One of them sat on it, and the other pinched it," says Howell.5 If you feel that nest removal is absolutely necessary, remove nests in the early morning or evening when the wasps are not flying. Vacuuming can also be used to remove mud daubers. Control: Cicada killers do not pose a stinging threat, so control is seldom required.11Their bothersome presence usually lasts less than two months.11 However, if wasp numbers are high or in a senstive area, the following tips can help with control and prevention. For a small number of wasps, eliminate wasps by swatting with a tennis racket or capturing in a butterfly net. Cover clustered burrows with a clear plastic tarp to prevent access and heat up the ground. In garden beds, a 3 inch layer of hardwood chips may deter nesting. Cicadas rarely burrow in dense, vigorous turf, so improve infested lawns by using appropriate liming, fertilization and watering.13 Mow high during nesting season. Cover rain spouts, vents, etc., with eighth-inch hardware cloth. If you find a nest in or near your home, let professionals manage the problem,17 but ask them to use alternatives to conventional pesticides. In California, and perhaps other states, an insecticidal soap product, M-Pede, can be used by licensed pest control personnel to kill Africanized bees. Berry, R.E. 1978. Insects and mites of economic importance in the Northwest. Corvallis, OR: OSU Bookstores, Inc. Personal communication with beekeeper Tom Howell, Feb. 15, 2002. DeAngelis, Jack. 1998. Urban entomology notes: Yellow jacket wasps. Corvallis: Oregon State University Extension. Univ. of Calif. Vegetable Research Information Center. Undated. IPMinfo. Integrated pest management for the home environment: Wasps. Texas A&M Univ. Agriculture Project. Undated. What should I do about the Africanized bee? Personal communication with Oregon State University entomologist Mike Burgett, June 3, 2002. Ahhhh wasps and hornets are so fascinating but they make me cringe haha. Those cicada killer wasps though! They’re so beautiful, but just imagine what they can do to us. Scary but oh so beautiful. Incredible photographs too! Similar to what https://www.hereandvowstudio.com/sarah-devon has done! Such incredible photography. Thank you so much for sharing! I generally leave wasps and hornets alone because they eat bugs in my garden and since we seem to have a shortage of honey bees in the area (except for those kept by beekeepers), they do a better job pollinating than nothing. They really don’t bug me even though I’m terrified of getting stung. Bad childhood experiences lol. The problem I have is that we have several paper wasp nests in our eaves, basically every side of the house and it looks like they are of the European variety. Normally I would just wait until winter and knock them down but we HAVE to paint our house this summer. NW weather gives us a very short window of time and the previous owners did zero maintenance on the siding so it’s in bad shape. I don’t want a bunch of pesticides spraying over my garden beds but I’m not going to try to capture them in a bag either, especially those that are 20 feet up. A couple are also close to each other and I’d likely piss off one to get to the other. Wasp stings are very painful as I’ve learned in the past when one flew up my shirt sleeve and attacked my arm and also when I accidentally disturbed a nest on my porch. I also don’t want to fork out hundreds of dollars to have them removed. Ugh and I just realized we have a nest in our gutter UNDER the leaf grate so I don’t even know how to get to that. It happens to be right where we set the ladder to get up on the roof. I’ve been cleaning roofs in Oregon, specifically around the Portland area for ten years and as I’m outside all day I can vouch with honest testimony that the population of bees IS DEPLETING RAPIDLY! #savethebees Now I’m not one who loves moss bit I have unconditional love for all insects and I still want wasps to be here in another ten years, even if it means a few stings every now and then. With that said please don’t get my attitude twisted. I am so grateful to see websites like this and other movements making a difference and I honestly believe believe bees are making a come back. I think they might be adapting, and I spotted a few new species of bees I think ,as they’re getting bigger and more hairy. If it makes you feel better I have noticed a slight increase of bees while cleaning rooftops around Portland OR in the 1st few weeks, but I hope that’s not because I’ve just been paying more attention. Once again, thank you so much for sharing this VERY IMPORTANT info with the internet. I am so fascinated by insects. I have been vegan for two years and have not fully understood why people choose not to eat honey until recently. I realize now that it is to protect the poor bees, and I can see why. They are so precious. There is SO much useful information on veganism and health on this blog https://fruitsforglutesfitness.com Amazing work. Keep the information coming! It is amazing, thanks for sharing! Another great way to observe their nest is to use a drone to fly overhead and use the camera on the drone to watch the bees or wasp as they move around in their nest. This also keeps the user of the drone at a safe distance where they will not disturb the nest. Even if the drone gets to close they will try to attack the drone which is relatively harmless to the drone and keeps the pilot safe. The drone also allows you to check on nest in places where it would be to high or difficult for a person to get to. Another great use for drone services. There are more honey bees than other types of bee and pollinating insects, so it is the world’s most important pollinator of food crops. It is estimated that one third of the food that we consume each day relies on pollination mainly by bees. Wasps, like bees pollinates plants and flowers as the feed on nectar. What great information about Bees and Wasps. There are so many more types then most people think there is. Your “paper wasp” is a southern yellow jacket, Vespula squamosa. I found a red bug with wings that had spots all over it. Does anyone know what it is?